Have you ever just had to have something,and when you got it you wondered what made you think you HAD to have it?? Frantically searching for the doll her daughter had to have, my friend Janet drove all over town looking for Generation Girl Barbie. She remembered how ridiculous she’d thought it was to watch the Tickle-Me Elmo craze and couldn’t believe how desperately she now wanted to find this one-of-a-kind doll. Finally, she tracked down Generation Girl days before Christmas. Janet couldn’t wait to see her daughter Ali’s excitement when she opened the box and played with her new friend for days on end. A week into the new year, Janet was cleaning house when she stumbled over Ali’s Barbies. Funny how they all look alike wearing no clothes! Generation Girl had ended up with the rest of her glamorous friends in a loss-of-identity crisis. Janet laughed out loud when she realized her efforts to accumulate the perfect collection had brought her nothing but a bucket of naked Barbies! Okay, so we're probably all too old for Barbies but don't we all have our crazy "have to have it" moments? So, what are some things you needed to have, or thought you had to have - got 'em and still wanted more. You know what I mean. Let's get real girlfriends - will they ever be enough? Please post your thoughts in my comments area (you can be anonymous) and I will do a drawing from my "authentic friends comments club" for a copy of the message I shared this week about coming to a point in my life where Jesus finally became my "enough" along with a Starbuck's gift card - my favorite Christmas treat! I'll send someone a CD to keep and one to give away! And then you can check off one thing on your Christmas gift list :-). Please note: I decided to extend this drawing through Monday since I am SO enjoying your comments. Also, I just finished my event in Colorado so I want to leave time for them to join in too!! Be sure to come back Tuesday, December 4th to see if you are the winner. We're back from the the Girl's Get-Away cruise. It was so much fun! Through Proverbs 31 Ministries and Premiere Christian Cruises, a few of us were given the amazing gift of a cruise to Cozumel, Mexico. Here's a photo of us girls at dinner time. 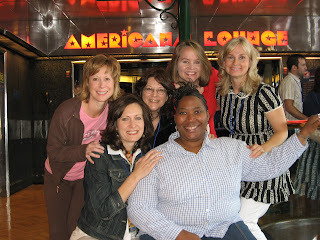 (Me, Shari, Sharon, LeAnn, Lysa and Marybeth). This was my favorite part of the day. 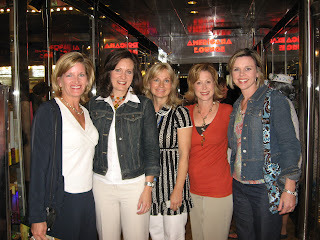 We had our own Proverbs 31 table where we laughed as much as we ate! I wondered if being out at sea for such a long time would be a little scary. Well, it was nothing compared to the shuttle bus drive from Pensacola, FL to our port in Mobile, AL. If you'd like to read the hilarious details and how Leigh from Point of Grace saved our lives, click here. I had the wonderful blessing of rooming with my "human alarm clock" friend who is set to wake up at 4am each day. I won't mention names but her initials are LT. Where does that girl get her energy!? Leann was supposed to get that blessing, but instead God gave her her own private cabin with a queen size bed all to her Queenie-self! Oh, but she missed out on some fun...rooming with LT was like being in college again. We shared jewelry, hairspray, and beauty tips. Too bad I don't have black hair since Lysa discoverd the perfect remedy for those rascally gray hairs that pop up. A black permanent marker will do the trick. I think we might patent the idea and create a "hair pen" for blondes, brunettes and those with auburn highlights. 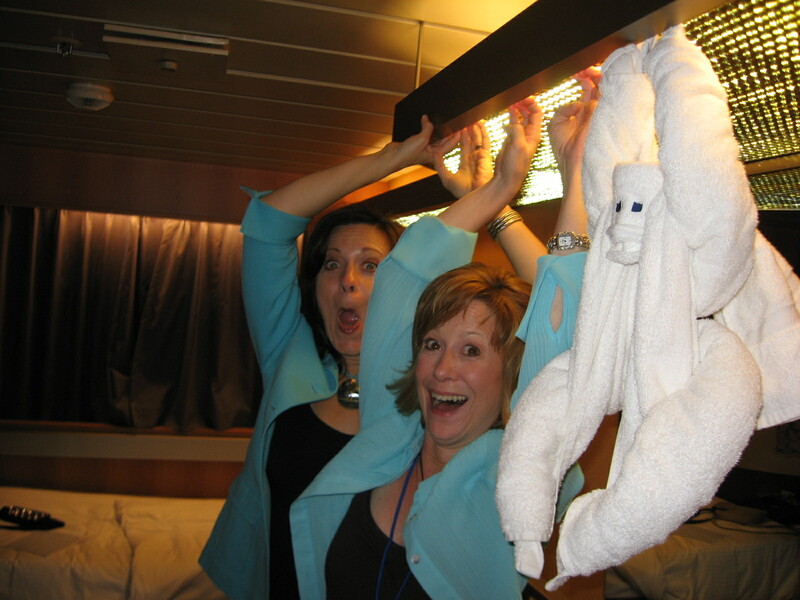 Here Lysa and I are swinging from the lights with our monkey-towel-friend who was waiting for us in our room that evening. I posted this last week and accidentally saved it as a draft!!! Please forgive me "Living Water's" retreat friends that I wasn't here when you came looking for me! I am now on a cruise ship in the middle of the sea somewhere between Conzumel, Mexico and Mobile, AL. I'll post more about our trip when I get home! I had an amazing weekend in Shepardstown, WV and today my heart is filled with indescribable JOY!! God showed up in ways I can't even describe. The theme of the retreat was Living Waters: Receive, Rest, Renew! We laughed, we cried, God poured His presence and His Word deeply, to satisfy the thirst of our hearts. We also ate way too much bacon and super-food thanks to our crazy-awesome worship leader Gwen Smith. I just have to share some behind the scenes things God was doing that few know about. He showed up in a way that was so personal to me, and came through in circumstances that had depleted my joy and my strength… I just have to brag on HIM! My body and mind were not feeling joy last week. My Andrew was sick Monday and stayed home from school. He had a cold but I wasn't so sure he was sick enough to miss school. When he got teary-eyed as I suggested he just go in late, I decided some mommy snuggles and a day at home wouldn't hurt. By Tuesday, I realized he was really sick as I headed to work feeling achy, foggy headed and drained! I felt horrible by Wednesday and couldn't sleep because my throat hurt so bad. I woke up at 3am Thursday morning, stayed up until 6am then went back to bed until 8am. I felt horrible all day. What was God thinking? I needed to review my retreat messages and finalize my preparations for the weekend. I slurped down chicken noodle soup that night, decided to take Tylenol PM and go to bed early. I emailed friends, asking them to pray for my messages, for the women God was bringing to the retreat, and for me to get some sleep! I felt so bad that the women coming might not get the fullness of what I knew God was calling me to say and give! Soon after I sent the email, I started feeling better. But then computer problems surfaced, slight panic set in and the unexpected dilemmas halted my bed-time plans! I was up past 10pm and still hadn't packed. Exhausted and feeling unprepared, I crashed into bed. I woke up Friday morning at 9am, threw my stuff in the suitcase and ran to the airport. (Notice. 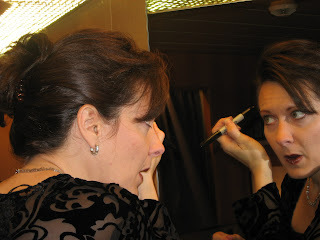 no mention of putting on make- up…I had no time!) I prayed on the way there that: I'd be on time, I’d be able to get Starbucks, put on make-up, check-in my suitcase without a fine for excess weight bs since I packed enough for two weeks, and that my boarding gate would not be out in Airport Egypt! I found a great parking spot, used curbside-check-in (no fine$) and found my friend/worship leader/traveling companion Gwen waiting in the security line. Much to my delight she didn’t have her eyes on either (no mascara or eye liner). We giggled at our shenanigans as we inched our way through the line and dashed to Starbucks; then to our gate - which was one of the first ones! Yea God!! Our sweet chauffeurs – Lisa and Stephanie - took us to Panera for paninis on the way to the retreat site. When we got there, we were given wonderful gift bags and our own beautiful rooms – with fluffy king size beds – which I wanted to throw myself into! Another sweet provision of God's grace. The tired, achy, scratchy, sneezy, coughy cold where you can’t sleep started settling in again so I laid my head down for a few minutes. Soon after, I realized it was time for dinner and I needed to change clothes. Lord, I prayed as I stood in my room with my arms lifted high and my hands opened toward Heaven, please empty me of anything left of myself. Please fill me with all of you. These women deserve to hear from You tonight. They have paid money to come away, they have moved Heaven and earth to get everything arranged at home to be here. Please speak through me despite my scratchy throat. Lord, ease my piercing headache and strengthen my feeble body. I am so tired and I need you desperately. It was an amazing night. God poured His Living Waters deep into my soul and splashed it out through my depleted body! I almost started crying as Jesus drew seven women to pray to receive Christ that night at the end of my message. It was just the beginning of a weekend at the well of Living Waters! In my weakness, Jesus' strength was powerfully perfected throughout the next three days. When it was time for me to be on HE showed up. And when I was done, my body caved. But then God would supply what I needed. He gave me a 3-hour nap on Saturday, along with His strength and His words for my message Saturday night. Again, my heart melted with joy as I watched more women pray to receive Christ at the end of the message. After the Saturday night session, we had an incredible time of celebration and worship with Gwen. I felt great! So we decided to put on our pajamas and continue the fun in the retreat hospitality suite. But just as I was getting on the elevator, I started feeling sick again. This time with nausea. I left the party quickly, went to my room and climbed into bed. However, I could not sleep, so I curled up in a ball and cried out to God to PLEASE not let me lose it! I still had one more session to do. Finally, around 3:30am I dozed off. Sunday morning came and the Holy Spirit poured His power and grace out again. It was simply amazing!! The music, the communion and the sweet message God gave me in those early morning hours was precious: Receive My Fullness, Rest in My Presence and Renew Your Heart in my Grace and Forgiveness and today as you leave, remember to REMAIN in My Love and Acceptance. God had called me to lead these women to the well of Living Waters. And He knew I could only do that by drinking deeply myself - receiving, resting and being renewed. Jesus gave as He promised and He was enough! In HIS presence I found the fullness of joy! In dependence I found completeness. Moment by moment, hour by hour, He poured our His Living Waters continually. I was filled, His purposes were fulfilled, and amazingly I spilled... just as He provided the women at the well...He gave me a well from within, a spring of Living Water welling up to eternal life so that I could know Him somehow help others to know Him through me - a cracked and leaking vessel. God tells us to rejoice in our sufferings – to find joy in our troubled times. He supplied everything I needed when I needed it! He is the strength of my heart and my portion forever!!! PS. If you were at the Living Water retreat, I'd love to hear how God poured into your heart that weekend in ways only you and He could see. PSS. 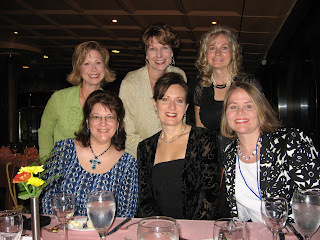 Today, I am scurrying around getting ready to leave with six of my P31 girlfriends for a Girl-Get-Away cruise!! Another sweet God-gift! I am so looking forward to resting. I've decided that thinking will be optional, at times. My brain needs a little break. Please pray for me as I try to recoup strength and get ready for the cruise. I still feel a little achy and sneezy but I am hoping some good rest and lots of prayer will do the trick!! Until I return to land next week, bon voyage! A few years ago I started making plans in November for the perfect Christmas. Our families lived out of town so inviting them to our new home for the holidays was a dream come true. The fact that they could all come at some point between Christmas and New Years was just short of a miracle! Plans danced in my head as I thought about my mom, my brother and my husband’s parents dropping in. My dad and his wife were going to be here Christmas day and JJ's brother and his family were coming, too. However, by the time everyone got here, I couldn't wait for them to leave! You see, I had gotten tangled up in Christmas lights and unrealistic expectations. My husband and children petitioned for colored lights on the tree that year! What? I don't do colored lights on the tree. I am a "white lights" kind of girl! Not only did they want colored lights, they had the audacity to vote for blinking colored lights, and they weren't kidding!! JJ then suggested that determining decorating schemes should be a "family activity." After seven years of white lights, what had gotten into him? Who was this man and why had this not been discussed during pre-marriage counseling? I seriously thought I was going to lose it. The control freak in me was freaking out! Don't get in the way of my perfect Christmas with white lights that make me and my home feel peaceful. Attempts to have the perfect house, the perfect menu and the perfect table settings were stealing my holiday joy! This was my first time hosting a family holiday dinner, so I failed to notice that my Christmas place mats didn't coordinate with my everyday cloth napkins and I didn't have festive napkin rings. Worst of all, I didn't know how to cook a turkey - I had never cooked a Christmas turkey. I had never cooked a Thanksgiving turkey or a July fourth turkey! In the midst of all the holiday preparations and obligations (that I placed on myself), I experienced one of my worst Christmases. Oh, I had a full house but an oh so empty heart! Christmas day I walked through my living room picking up wrapping paper and wondering why my dreams of a "perfect Christmas" hadn't come true. Everyone was here. Isn't this what I wanted? Kids running around with remote control cars, adults on the couch snoring to the tune of jingle bells, and grown men playing sidewalk hockey in the driveway? Trying to escape the holiday noise, I went upstairs to my bedroom to read my Bible and restore my sanity. I could still hear them, so I tiptoed through my bathroom into my walk-in closet and sat in a corner hoping no one would find me. Why was I so miserable? Weren’t we having a Christ-centered Christmas? We'd lit Advent candles and set out the nativity. I realized I'd been so focused on Christmas lights and table settings, that I'd forgotten to set a place at my table for Jesus, the Light of Christmas. I opened to the book of Luke and read, "And she gave birth to her firstborn, a son. She wrapped Him in cloths and placed Him in a manger because there was no room at the inn." (Luke 2:7) I closed my eyes and imagined Mary wrapping Jesus - like a gift. There has been no room at the inn of my heart, I thought. As I opened my eyes, I glanced at the footnote referencing Isaiah 7:14, "The virgin will be with child and will give birth to a son, and you will call Him Immanuel, God with us." Just like the gifts under my tree, I realized Jesus was waiting for me to unwrap His presence so He could lavish His peace and love on me! I had forgotten to unwrap the greatest gift of all - Imannuel, God with us. His presence was what I needed to have the perfect Christmas. His presence would bring peace to my heart and home, unlike anything white lights and matching table settings could bestow. I bowed my head and unwrapped His presence in my closet that day. I invited Jesus to bring peace to my anxious heart. To bring His perspective to my expectations and to help me enjoy the gifts of my family that were waiting downstairs. It ended up being the best Christmas after all! Do you ever get tangled up in expectations and preparations? Do you have control issues with lights, decorations and perfect place settings? What about secrets to enjoying a simple, Christ-centered Christmas? In the holiday rush, how will you set aside time to experience His hush as you unwrap the gift of His presence? I loved it!!! So, I set one aside to pay for later. I had no idea how prophetic that quote would be over the next 24 hours. The conference was one of the most annointed events I have ever been part of - and I have had the amazing privelege of being part of some very annointed events. The women from Well Spring ministry had bathed every inch of every detail for that event and God showed up in so many powerful ways. As you may know, my friend Lysa wrote a book called "What Happens When Women say Yes to God." It's my favorite book! 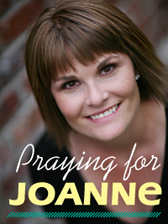 She has incredible stories of faith that I know the ins and outs of. I've lived with her through many of them and can say with full conviction that she lives what she writes and speaks about. But as I sat in the audience that weekend listening to Lysa speak, it was like God was speaking directly to me!!! That doesn't happen very often when you know the speaker really well. You've heard the stories, you' ve seen the stories. But God!! It was clear that He was not giving me a review of Lysa's story, He was giving me a preview of my own. During the last message God clearly spoke to my heart about fears and concerns I have had for the past few years. He answered every one with huge confirmations and told me He wanted me to go home and tell JJ that "God is calling us to adopt a daughter (or two) from Africa." My heart emptied of all fears and filled with joy as I said "Yes, Lord. I will!" The coolest part is that JJ has been praying for almost 3 years that God would give me the same desire he has to adopt. He was speechless when I told him at 10pm that night when I got home!! These have been a few amazing weeks. Needless to say, adoption has been the main topic of our conversations and prayers!!! The first and most amazing thing we found out (the day after we said yes to God ) is that JJ"s company will reimburse up to $10,000 in adoption expenses. The next day I contacted my friend, Deanna Falchook, who is about to adopt three children from Ethiopia. We are feeling led to go through the same agency. She has been an amazing source of help - like Jesus with skin on! We are going to adopt at least one girl, maybe two. We are praying for her to be between 5-9 years old. It's been a crazy time to jump into this adventure with my speaking season in high gear and me traveling but honestly God has gone before us and done so much already!!! We completed our application in a week and sent it to the agency last week. We also completed the first portion of government paperwork. Now we need to do our homestudy and dosier. We have so much peace and know it's all going to happen in His timing and perfect plans. Thanks for your prayers. I can't wait to share this part of our journey with you! His love moves me to extremes! Oh, it is so hard to choose only one winner. I just couldn't do it so I had my husband pick a number between 1 and 42 since that is the number of entries I had. He chose number 40 and the winner is Heather at MommyMonk. Congratulations Heather! I'll send your gift as soon as we connect so I can get your mailing information. Thanks everyone for participating in the fall giveaway. Be sure to stop by later this month. I am going to giveaway a Christmas CD. 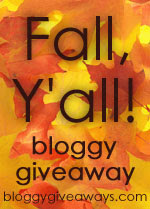 Just in time for a my favorite season, I am participating in the Fall, Ya'll blogger giveaway. And you can win!!! You can enter to win all kinds of cool stuff on Shannon's blog. She is the host for the Fall Y'all blog give away and has all kinds of people registered to give all kinds of things away. What a great way to start your crossing names off your Christmas shopping list. Oh, and hop over to my HeBrewsFaithCafe too. I'll be giving more fun stuff away for those who sign up there.